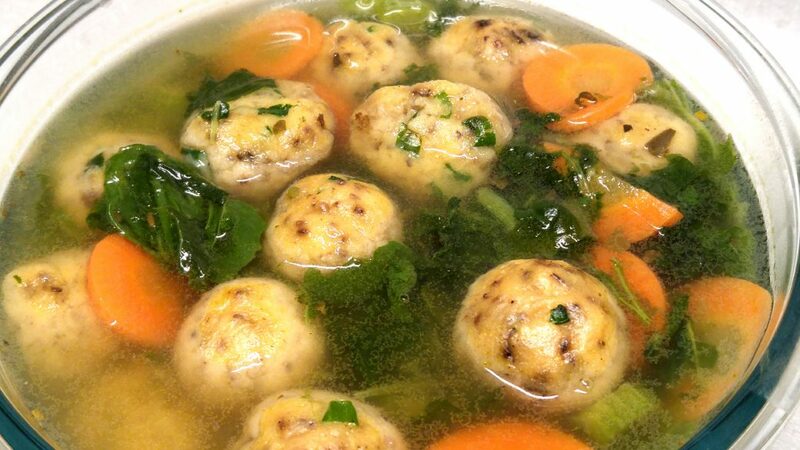 Growing up in a Jewish household, matzo ball soup was a common dish. My grandmother’s recipe was my absolute favorite soup. Helping her roll the matzo balls brings back some cherished memories. Here is my vegan take with a twist on this classic soup. Infusing low-sodium veggie broth with a generous amount of thyme makes for an excellent chicken broth replacement. The masa balls are mixed with baking soda to make them light and fluffy, combined with ginger, pepper, garlic, onion and green scallions. Chia gel is used in place of lard and eggs in original masa dough. They are steamed first then added to the soup at the end when ready to serve. First, let’s set up the chia gel. Combine 2 Tbsp chia seeds with ¾ cup cold water. Mix well and set aside while we put the rest of the recipe together. Takes about 15 minutes and the chia seeds will form a nice thick gel. We are going to steam the masa balls instead of cooking them in the soup. Depending on several factors, soup heat, boil length and masa mixture they may fall apart. Steaming will cook and firm them up perfectly. Combine all the masa try ingredients and mix very well. Add 1 cup low-sodium veggie broth and combine thoroughly. This recipe will yield about 45 1 tsp sized masa balls. They will increase in size as they stream. Steam them covered for 30 minutes. 1 ½ c frozen spinach or 4 cups fresh. While the masa balls are steaming let’s set up the soup. In a medium saucepan start boiling 6 cups of low-sodium veggie broth. Add the carrots, celery, onion, and spinach. Lower to a simmer and cover. After 30 minutes, the masa balls will be done and ready to plate.